Kids love being apart of the gift giving during the holiday season and this is the perfect way to include them. We filled up baskets with Christmas morning necessities such as Private Reserve Community Coffee, mugs, chocolate, and some other holiday goodies then the kids added in their decorated mugs to the baskets so that whoever we gifted them too could enjoy a hot cup of coffee Christmas morning! 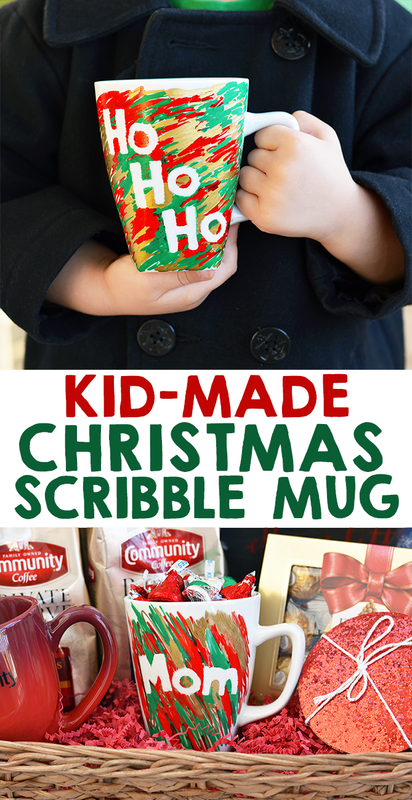 With this craft you can personalize it to a specific person by adding their name or use a holiday saying like “Ho Ho Ho”. If you’re doing this craft with a younger child, it will require adult supervision because we use paint markers. 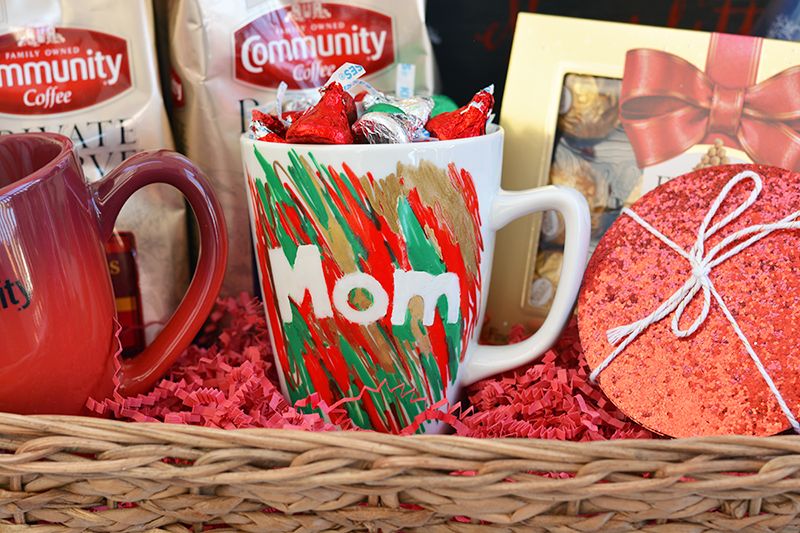 Check out the easy tutorial and make sure to enter our giveaway below to win your own Kid-Made Gift Basket that includes all of the supplies to make your own holiday mug! First you’ll use the stickers and place them on the mug to create your design. 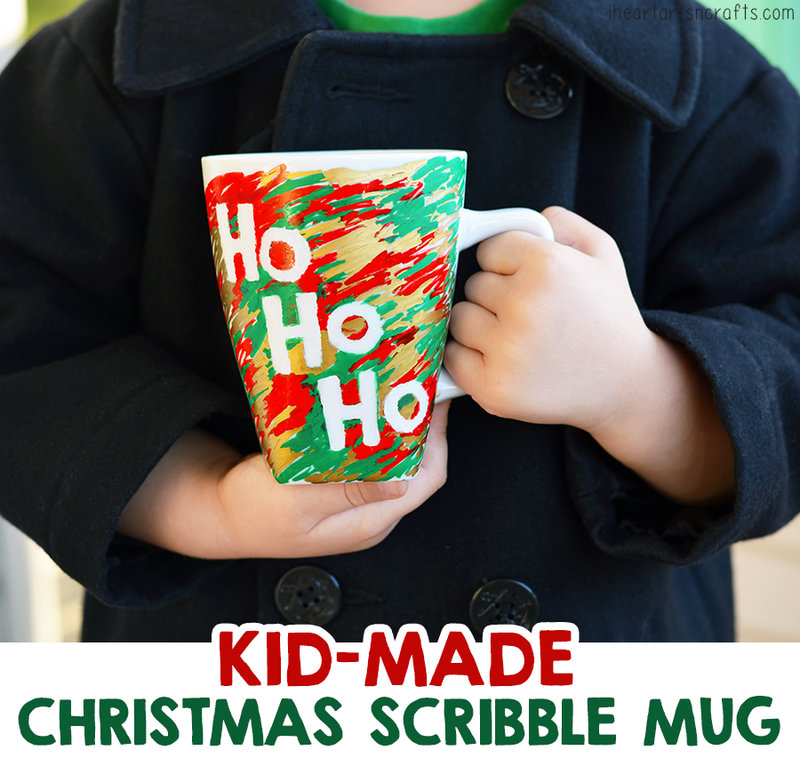 Next have your child scribble some designs on the mug, make sure that most of the mug is covered so that when you peel of your sticker you can see the design. Let your mug completely dry and then peel off your stickers to reveal your white design underneath. You will then bake the mug at 350 for 30 mins. Then let the mug cool down and start filling your holiday basket! **Tip: If you have trouble peeling off the sticker use a tweezer to peel them up. And if any marker seeps through the edge into your design, simply wet an end of a q-tip and wipe any excess off. Note: We only hand wash these and the design has kept up perfect. Keep in mind that when you bake it the colors may darken. 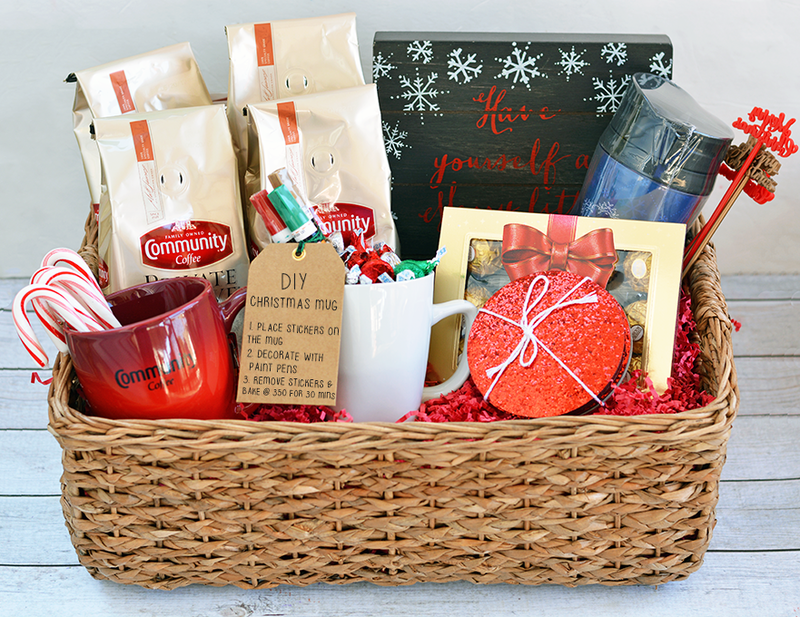 For our basket we made sure to fill it with some of my favorite holiday goodies which of course is coffee because I NEED coffee to make it through Christmas morning! I also included some holiday glitter coasters, coffee travel mug, holiday canvas decor, 4 bags of Private Reserve Community Coffee and chocolate. Because what would a Christmas gift basket be without chocolate! 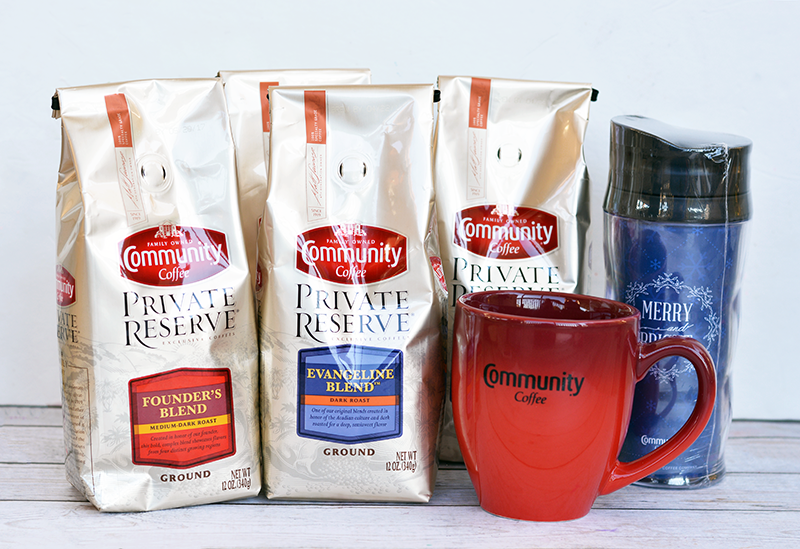 The Community® Private Reserve® line is an exclusive collection of blends and single-origin coffees made from 100% specialty-grade Arabica coffee. Each unique coffee represents a story of the company’s rich heritage and of special relationships built with farmers worldwide over several decades. Private Reserve® coffees are available in whole bean and ground and include Founder’s Blend coffee, Evangeline Blend™ coffee, Louisiana Blend® coffee, Espresso, Founder’s Blend, Colombia Toledo-Labateca, Brazil Santos Bourbon, Sumatra and Rwanda. To learn more and to purchase online visit CommunityCoffee.com or find the brand on Facebook and Twitter. Now once your mug is cooled off and ready to go fill it with some goodies and it’s ready for in your basket! 4 Bags of Community Coffee from their Private Reserve line including Evangeline Blend™ & the Founder’s Blend. 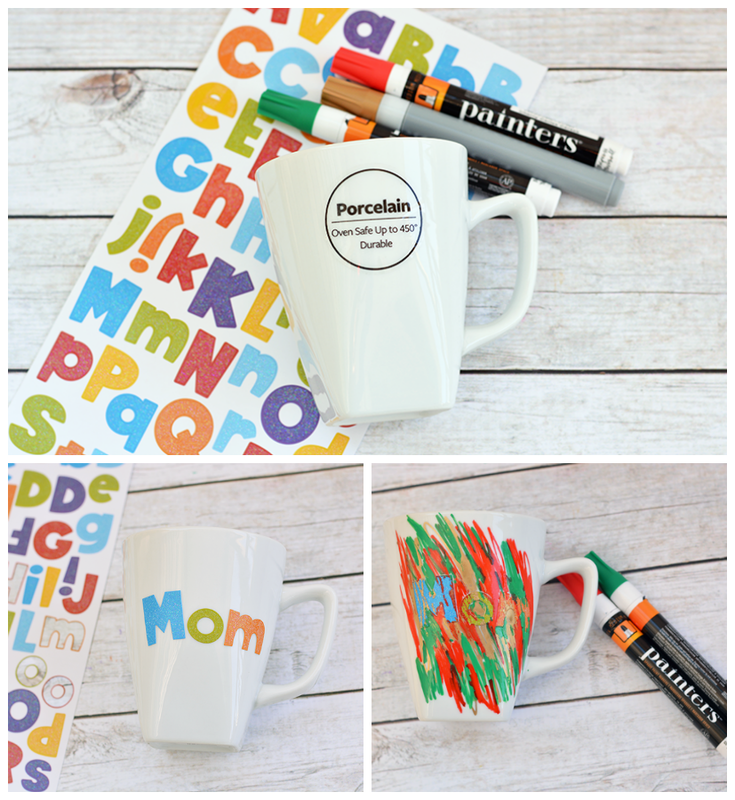 DIY supplies for your own holiday mug – Paint Pens, Stickers, and Porcelain Mug. Enter in the widget below! And before you go make sure to vote on your favorite Community Coffee gift basket!